Four players scored for the Ottawa Senators in a 4-1 victory that included two goals in a 13-second span against the host Carolina Hurricanes on Friday night in Raleigh, N.C.
Magnus Paajarvi, Bobby Ryan, Mark Stone and Christian Wolanin found the net. Cody Ceci supplied two assists for the Senators, who have won four of their last five games. Warren Foegele scored for Carolina, which doesn’t have another home game until February. 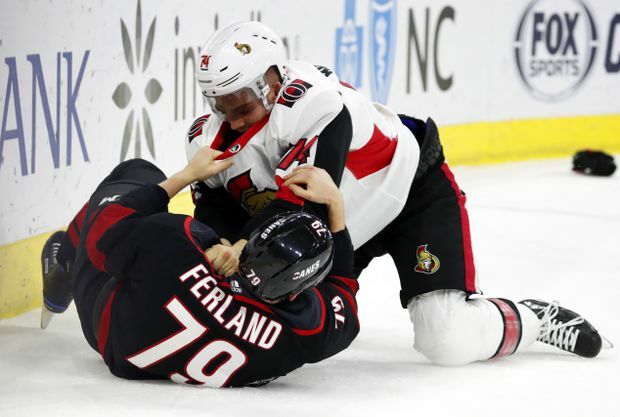 Ottawa Senators' Mark Borowiecki tussles with Carolina Hurricanes' Micheal Ferland during the first period of an NHL hockey game on Jan. 18, 2019, in Raleigh, N.C. Senators goalie Anders Nilsson stopped 33 shots, pushing his record to 7-11-1. Carolina goalie Petr Mrazek made 22 saves. He also gave up four goals Jan. 6 at Ottawa, but the Hurricanes won that game. The Hurricanes have dropped two in a row after winning seven of eight games. They went on two power plays in the opening 10 minutes, but the scoring chances were limited. Carolina managed only five shots on goal through 13 minutes. Ottawa, which improved to 7-15-1 in road games, scored four goals on its first 19 shots. Paajarvi scored on a rebound for the only goal of the first period after Mrazek’s block on Ceci’s initial shot. Ryan scored his 10th of the season, tallying for the third time in five games when he took advantage of a failed clear in front of the net. Thirteen seconds later, it was it 3-0 when Stone scored directly off Chris Tierney’s faceoff pass. It was Stone’s team-leading 22nd goal of the season. He has scored in consecutive games five times this season, all since Dec. 1. Foegele put Carolina on the board with an unassisted goal with 8:36 to play in the second period. It was his first goal in eight games. Wolanin made it a three-goal gap again when the Senators converted after the puck took a bounce off the boards behind the net. Right winger Nino Niederreiter was on the ice at the start for Carolina a day after he was acquired in a trade with the Minnesota Wild. The Hurricanes gave up Victor Rask in the deal. Ottawa continues its weekend trip with a game Saturday night at St. Louis. Carolina plays three road games before next week’s NHL All-Star break.